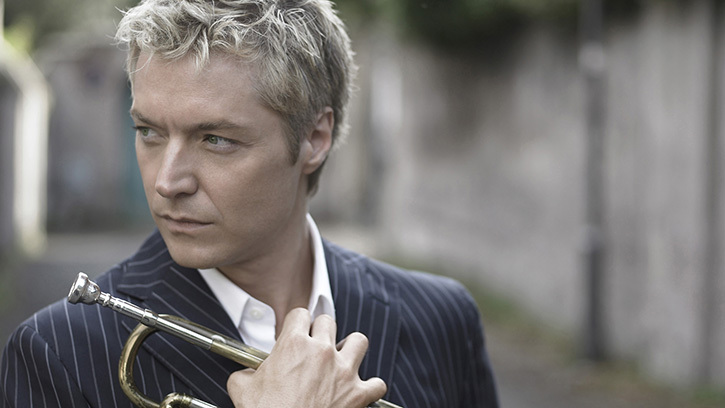 Trumpet player Chris Botti performs with the Seattle Symphony on September 29, 30 and October 1. For the globetrotting Chris Botti, home is a suitcase and his trumpet a constant companion. On September 29 Botti lands at Benaroya Hall to bring his dizzying blend of music to the Seattle Symphony. With four No. 1 jazz albums and a Grammy for Best Pop Instrumental Album, Botti has established a reputation as a versatile musician who moves easily through pop, jazz and even classical music as easily as changing into one of the six suits that travel everywhere with him. Botti has made a career by challenging himself to learn from outstanding artists. Following early stints with legends like Sting and Paul Simon, Botti has played with everyone from John Mayer and Josh Groban to Yo-Yo Ma. Today he travels with a handpicked band of musicians. Renowned for the smooth, warm sound of his playing, Botti’s concerts with the Seattle Symphony will move through Italian opera, pause briefly for some jazz standards and conclude with rock classics. Many of the arrangements are by Botti himself. But what sets Botti apart is his contagious joy for the musicians in his band. As front man for the ensemble, he frequently cedes the stage to feature them as soloists. Don’t miss your opportunity to hear Chris Botti with the Seattle Symphony on September 29, 30 and October 1!